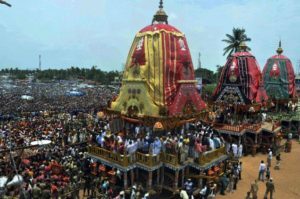 Puri Jagannath Rath Yatra 2017 is on Sunday, 25 June. Puri Jagannath Ratha Yatra is the oldest Ratha Yatra taking place in the world. It is mentioned in many Hindu sacred texts like Brahma Purana, Padma Purana, Skanda Purana and inKapila Samhita. The celebration follows all the same rituals from its starting. The festival is celebrated every year on Dwitiya Tithi that is falling in Shukla paksha of Ashada month (second day in the bright fortnight of Ashadamonth). RathaYatra is also called as Gundicha Yatra or Navadina Yatra.